Dr. Carol Adelman is a Senior Fellow and Director of the Center for Global Prosperity (CGP) at Hudson Institute where she lectures, writes, and advises governments and media on global philanthropy, international health, economic growth, and foreign aid. She is also a visiting professor at the Indiana University Lilly Family School of Philanthropy. Dr. Adelman also developed The Index of Philanthropic Freedom, the first in-depth analysis of the ease of giving across the world. Local experts from 64 countries participated in the survey which ranks and compares nations on a variety of indicators, including the ease of non-profit registration and operations, tax incentives, and cross-border barriers to philanthropy. Altogether the study comprises 81% of the world’s population and 87% of the world’s gross domestic product. It includes country specific reports, trends, and policy recommendations. From 1971 to 1981, Dr. Adelman was a career foreign service officer with the U.S. Agency for International Development (USAID), living and working in Africa, Latin America, and Asia. She worked extensively with foreign governments, NGOs and companies involved in economic development projects and philanthropic programs, and she advised governments on policy reforms for economic growth and democracy. From 1982 to 1988, Dr. Adelman focused on global economic and health issues. She completed research for her doctorate in public health, examining the causes of infant mortality in the barrios of Lima, Peru. She also consulted for the American Red Cross and monitored famine needs in Africa while assisting in fundraising for the African drought. From 1988 to 1993, Dr. Adelman was a presidential appointee, serving as assistant administrator at USAID in charge of all foreign aid programs to Asia, the Middle East, and Central and Eastern Europe when the Berlin Wall fell. She supervised over 400 employees with a budget of over $3 billion. From 1989 to 1998, she headed international services for two different consulting companies, one private and one publicly held, where she identified investment opportunities and capital for private U.S. companies in overseas hospitals, insurance companies, and healthcare systems. Dr. Adelman identified U.S. partners for joint ventures in Brazil, Argentina, and Malaysia. She conducted a major evaluation of public/private sector programs developed by the Inter-American Development Bank. Since 1998 to the present, Dr. Adelman has conducted research and writing at the Hudson Institute where she and her Hudson colleagues also assist nonprofits and corporations in developing and communicating their global philanthropy programs. She is also president of an executive leadership training company and teaches leadership for corporations and at the Wharton Business School, University of Pennsylvania, the Aspen Institute, and World Economic Forum at Davos. The company has been featured in major publications including the New York Times, Washington Post, Wall Street Journal, People, Forbes, and in numerous trade journals. Dr. Adelman has served as Vice Chair of the Advisory Committee on Voluntary Foreign Aid for USAID and Vice Chair of the Helping to Enhance the Livelihood of People (HELP) Commission, a bipartisan congressional commission established to provide high-level oversight and evaluation of the U.S. foreign aid program. She is a past Vice Chair and current board member of the Atlantic Council, a member of the Council on Foreign Relations and serves on the boards of Freedom House and the American Shakespeare Center. Dr. Adelman is a recipient of the Heloise Waislitz Visiting Fellowship in Philanthropy at the Asia Pacific Centre for Social Investment and Philanthropy, Swinburne University, Melbourne, Australia. She is past president and current board member of Capital Partners for Education, a charity that provides scholarships and mentors for low-income students in the D.C. metropolitan area. Dr. Adelman has appeared on radio and television, including CNN, PBS, Fox News, C-Span, and BBC, and is a frequent commentator, lecturer, and moderator at universities, associations, and international conferences including the Aspen Institute, the World Economic Forum at Davos, the Council on Foreign Relations, and the Fortune 500 Brainstorming conference. She was featured on PBS’s The Great Decisions Television Series episode on Philanthropy and the Rise of Global Giving and also in an exclusive interview in the Financial Times. She is the author/editor of numerous works on economic growth, foreign aid, trade, and global health for national publications and technical journals. She has written for the New York Times, Washington Post, Wall Street Journal, Foreign Affairs, and International Herald Tribune. 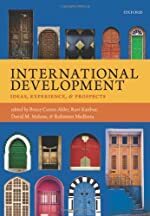 She has published a book, International Regulation: New Rules in a Changing World Order, and contributed a chapter to International Development: Ideas, Experiences, and Prospects, a comprehensive review of economic development supported by Canada’s International Development Research Centre. Dr. Adelman holds a Doctorate and Masters of Public Health from John Hopkins University and a Masters in Foreign Service from Georgetown University. For the latest news and updates from Hudson’s Center for Global Prosperity, visit CGP’s blog at http://globalprosperity.wordpress.com/.